Think you’re the only one who’s had a bit of a setback in recent months? You might be surprised to learn that many Americans who’d always enjoyed a stellar credit rating have found themselves struggling with making their credit card payments. Of course, depending on how you treat these setbacks, picking up the pieces of your financial life doesn’t have to be an impossible feat. If you’ve suffered a job loss, foreclosure or other credit difficulties, there are no shortcuts – but you can rebuild your credit and once again enjoy the sense of security with knowing you have options. It takes time, but it’s done every day. 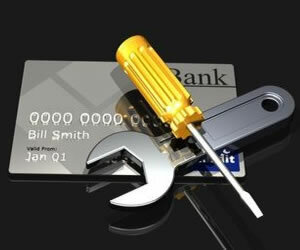 Here, we’ve put together a few of the best credit reporting credit cards available on the market. Take a look and then choose the one that best suits your unique needs. Keep in mind, there’s a good chance you might be stuck with higher APR rates or other restrictions, but it’s temporary and once you’ve gained solid footing again, these difficult days will be behind you. This particular card offer has a lot of perks, especially considering it’s designed for those with less than perfect credit scores. You’re guaranteed approval with up to a $2,500 unsecured credit line with no credit check and no interest charges. You are required to put a 10% cash down payment on any purchases made with the Prestige card, but it’s a great alternative to cash. Not only that, but shopping online is possible, something cash simply can’t accomplish. Among its many advantages, your history is reported to the three credit bureaus and you’re offered the opportunity to participate in the emergency roadside assistance, credit card protection and even prescription discount plan programs. There are a couple of considerations you’ll need to understand. First, there’s an annual fee of $99.00 and if you don’t use the credit card often, you might be subject to a $19.95 inactivity fee. Late payment fees are $10 and if your payments don’t clear your bank, whether it’s via ACH or traditional checks, you incur a $30 fee. The Open Sky Visa also reports to all three bureaus and it doesn’t require a credit check nor a checking account. There is a $50 annual fee and your credit line is determined by your security deposit, which can be as little as $300 or up to $250,000. Your money is protected in an FDIC Insured account and should you close the account, your deposit is returned, minus any outstanding charges. The $79 annual fee isn’t deducted from your initial deposit, but is treated as a charge, which can be paid with your first payment. Finally, there are no monthly maintenance fees or annual charges, making this an attractive offer for those looking to improve or rebuild their credit histories. Finally, we take a look at the AccountNow Prepaid MasterCard. Issued by Meta Bank, this prepaid card has no annual fee and no minimum balance is required. No worries about traditional credit or employment checks, either. This plan does have a $4.95 monthly maintenance fee (or those choosing the Premium Plan pay $9.95). For those who do select the Premium Plan, there are no fees associated with reloading the card or online bill payments. Easily download your monthly statements or request hard copies for $5 per request. Many parents like this card because they can easily help their teens and young adults learn about the importance of budgeting one’s money. Once that’s accomplished, of course, card holders can then seek unsecured credit cards that better meet their changing financial needs. Any of these prepaid card offers will more than meet the needs of those looking to strengthen their credit histories. They’re yet one more financial tool designed for a changing American consumer. Be sure to carefully review all fees and conditions associated with any credit card offer so that you’re making the best financial decisions.